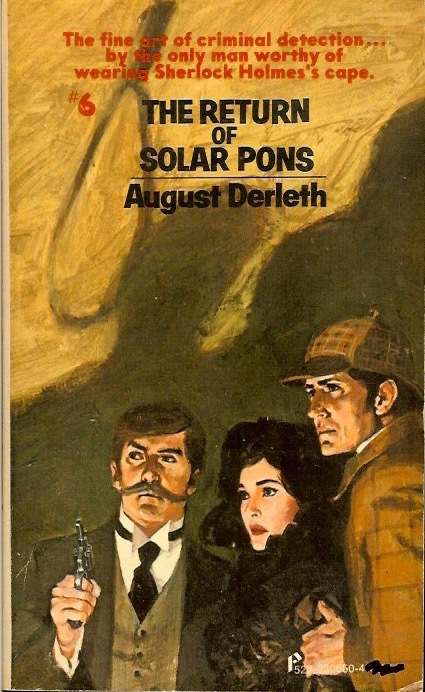 Solar Pons, "the Sherlock Holmes of Praed Street," returns in another collection of stories by August Derleth. First published in 1958, this 1975 U.S. Pinnacle paperback includes an introduction by Edgar W. Smith. As you can see by the numbered cover, this was Pinnacle's 6th Pons publication. Who is Solar Pons? Who, indeed, is Sherlock Holmes? 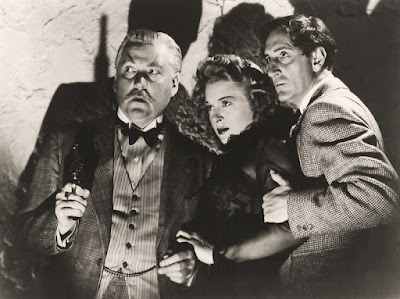 They are inventions of two superlative storytellers...the invincible Arthur Conan Doyle of London, the prodigious and prolific August Derleth of Wisconsin. The whole world knows of the legendary Holmes and his Baker Street beat. But only a few of the most dyed-in-the-wool aficionados of detection have been privileged to make the acquaintance of Solar Pons and his Praed Street office. Here then is Solar Pons at his best. Only Watson himself could distinguish between the footsteps of Pons or Holmes. If you've not yet joined us in the chase, you are about to discover new joy in a tradition that, alas, has disappeared. Come, the game is afoot!